ClubCoins Benodigd: 400 Software is not compatible with mobile and tablet devices. Please add this title to your Wish List and sign on to your the first club account from a desktop computer to complete your redemption. ABOUT THE SOFTWARE Laplink PCmover Professional 10 is the ONLY software product that automatically transfers all selected files, folders, setting, user profiles and applications from an old PC to a new one (or from an old operating system to a new one). Because most applications transferred are installed ready-to-use on the new PC, there’s usually no need to find the old CD’ for previously … downloaded programs, serial numbers, or licensing codes. PCmover Professional 10 is the easiest way to restore or move to a new PC without leaving anything behind, even when the old and new PCs have different versions of Windows. Nothing is erased on the old PC and nothing is overwritten, the new PC. 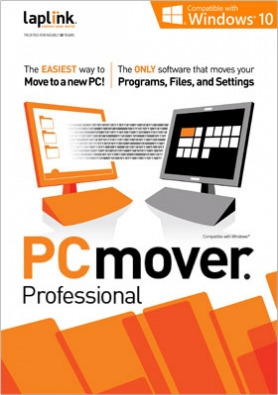 To use PCmover, simply install it on both your old and new Windows computers, and follow the easy-to-use wizard. When the transfer is complete, your new PC will have the personality and functionality of your old one, without any overwriting or corruption on your new PC. The Easiest Way to Move to a New PC PCmover Professional 10 is a quick and easy way to transfer from one Windows PC to a newer one, including Windows 10, saving you hours or days of time in setup. PCmover's advanced features lets you choose which applications, documents, users, and settings to take with you when you move the data to your new PC. If your computer has multiple users, PCmover Professional gives you the option to transfer some or all of the users. The security information about file ownership and access control is preserved for each user, too. Multiple Migration Paths and Options	PCmover Professional can migrate your PC across a network, a Laplink Ethernet cable, or a Laplink USB cable. Unlike any other migration software, PCmover supports a direct migration from an image or an old hard drive directly Easy to Use	PCmover Professional 10 makes the process of setting up a new Windows PC simple, using a step-by-step wizard-like process. PCmover was built to eliminate the traditional rituals that come with the purchase of a new PC. It offers a ‘hands off’ solution that allows users to recreate their old computer’s personality and functionality on their new PC, while experiencing minimal downtime and reducing the cost of purchasing programs again. 24/7 Transfer Assistance	Quickly set up your new Windows device with the help of a certified PC migration expert, over the phone or remotely. Applications transferred to your new Microsoft Windows 10 PC can be accessed by clicking on the application’s “tile” on the Windows Start screen. To access the Start screen from the Desktop, move your mouse to the lower-left corner of the Desktop, and click on the Start icon that appears. Once on the Start screen, scroll to the right to find your applications, which will be listed as individual “tiles”. Set Up Old PC First To perform a PCmover transfer, start PCmover on your old PC first. Complete the PCmover screens as directed in the section Old PC > Setting up the Transfer. Then, when instructed to do so by PCmover, start PCmover on the new PC. Complete the screens to prepare your new PC and perform the transfer; beginning with the section New PC > Setting up the Transfer. Lightning-Fast Transfer Transfer everything across your network or use an optional Laplink high-speed transfer cable Sold separately). Stop waiting hours or days with PC setup. The transfer may take quite a while, depending on several factors: the size of the hard drive(s) you are transferring, the amount of data on them, their level of fragmentation, the number and size of applications and other files and folders you are transferring, and other factors. Microsoft’s latest version of Windows has significantly reduced the usefulness of Microsoft Windows Easy Transfer. Previously, Microsoft allowed users to transfer files and settings directly from one Windows PC to another across a network or using an Easy Transfer Cable. Now, in Windows 10, users can only transfer data files using only external media, like an external hard drive or USB stick.KEY FEATURES PCmover Professional 10 Key Features: Improved handling of multiple user accounts including Microsoft Accounts (MSA). Multiple Transfer Scenarios Supported: Use PCmover to move from an old PC to a new PC; to transfer all of the data from an image (or old hard drive) to a new PC; or, to complete an in-place upgrade, from Windows XP all the way to Windows 10. Complete Selectivity: Select and copy the applications, files, users, and settings you choose to your new PC. Programs are installed, ready to use. Easy user interface: Install PCmover on both of your computers and follow the simple setup guide to start transferring everything you select to your new PC. Faster transfer speeds: PCmover’s enhanced performance speeds find files faster, and transfers them at speeds 200% faster than earlier editions to your new PC or OS. NEW AND IMPROVED FEATURES PCmover Professional 10 includes the following new features: Transfer speeds up to 200% faster. Seamless integration with Microsoft OneDrive. Significant enhancements in application detection, compatibility, and migration. Migration experience optimized for working with data stored on cloud providers including OneDrive and Dropbox. SYSTEM REQUIREMENTS Operating system: Microsoft Windows 10, 8, 7, Vista, XP Processor: Intel® or compatible Pentium® or higher processor System RAM: Same as minimum required by operating system. HD space: 200 MB of available hard disk space required to run PCmover Display screen size: N/A Video card: N/A Other (internet; browser): N/A List of interface languages: English, French, German, Italian, Spanish, Chinese Traditional, Chinese Simplified, Korean, Portuguese, Russian, and Dutch. PCmover is not designed for migrations from newer operating systems to back to older operating systems. For example, we do not recommend attempting to migrate from a PC running Windows 10 to a PC running Windows 7, as doing so may render your system unstable. Antivirus and Anti-Spyware programs will not be moved to your new PC. You should remove trial software on the new PC if a full version exists on your old PC.